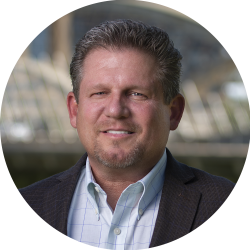 Craig has managed design, development, and construction activities for leading, high-growth organizations for over 25 years. His professional experience and expertise span the entire development process, including market planning, site selection, due-diligence and entitlements, design phase management, agency and governmental approvals, construction cost estimating, construction management, and project closeout and sale. Before joining The Woodmont Company, Craig was the Senior Vice President for Intertek-PSI where he managed a 23-state region of business development professionals and part of the Senior Management Team that lead pursuit and capture of large-scale projects. Prior to Intertek, Craig was the Vice President of Design & Construction for Highgate Hotels leading design and construction management for new ground-up high-rise and major renovation hotel projects, one of which awarded 2nd in USA & 7th in the world “Best New Hotel 2013”. Before his position with Highgate, Craig was the Vice President of Development for Salvo Real Estate Solution where he managed all functions of a commercial real estate development company. Prior to Salvo, Craig was the Project Management Director for Brinker International managing the design, development, and construction of Maggiano’s restaurants. Early in his career, Craig led a team of design and construction professionals for La Quinta Inns Inc. as the Director of Development and Construction Services completing 73 new hotels in 4.5 years. He also led the development of the company’s franchise program providing design, development, and construction oversight and support. Beginning his career as a civil engineering consultant, he managed the civil design of a wide range of land development projects.